In a few days, Jewish people around the world will be celebrating the Feast of Sukkot (Tabernacles) in small “booths” or “tabernacles” they have built in their yards. They’ll live in these little huts for seven days (or at least eat their meals there), in order to remember God’s care during their 40-year wilderness trek to the Promised Land, because God commanded it in Leviticus 23:39-43. 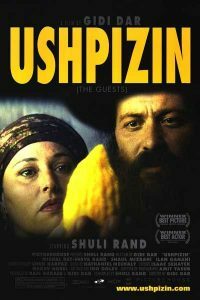 If you want to see how these ancient traditions are still observed today, you have a superb opportunity in a movie that came out a few years ago called Ushpizin (OOSH-pee-ZEEN). The word means “visitors,” and refers to the tradition of showing hospitality to visitors in your sukkah during the Feast of Sukkot. 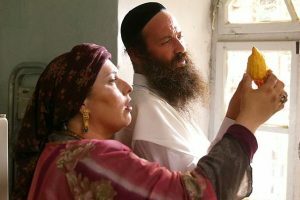 The story revolves around the lives of Moshe and Malli Bellanga, an extremely poor couple who live in an ultra-Orthodox neighborhood in Jerusalem. Both of them are ba’al teshuvah, (“masters of repentance”) meaning that they became observant as adults, and they are still learning to live according to Jewish traditions. Ushpizin is one-of-a-kind in that it is the only movie ever made by ultra-Orthodox Jews, who normally stay far away from public media. When it debuted in Israel in 2004, it won all sorts of awards because of its delightful story and excellent acting. (You can read the story here.) It’s a real favorite of mine. The entire movie was played by Haredi Jews living in their own neighborhoods in Jerusalem, so you get an amazingly authentic glimpse into their very private lives. Considering how stifling its strict rules would seem to be, I was amazed at the characters’ humor, faith and gentleness. You can watch the movie online or buy it at Amazon. It is in Hebrew with subtitles. Not only will it teach you about Sukkot, it is a delightful story. I highly recommend it. We always watch this moving at Sukkot. We’ll be camping with about 80-90 people in NW Indiana starting on Sunday! Its gonna be so much fun. Maybe you would like to come speak next year? In fact, I can’t wait to get to Sukkot to read your new book…Hope you have a wonderful Sukkot! Looks to be a very excellent movie, and thank you for sharing about it. I will share it with my readers on my page. And will be watching this movie online. Love, love, love Ushpizin. Actually had a friend send a copy from Israel before it was released here in the States. I can’t recommend this movie enough. It provides a great look at Sukkot and I was impressed with the authenticity of this film. I read somewhere that when the cast was filming the movie, the Breslov Hasidim insisted on “dancing breaks” every few hours, so that they could rejoice before the Lord. Love it!